Part of the Rick Steves philosophy is to learn about and understand the culture of the countries you are visiting. Writing this article, I learned so much more about one of my favorite countries, our fascinating neighbor to the south, Mexico! 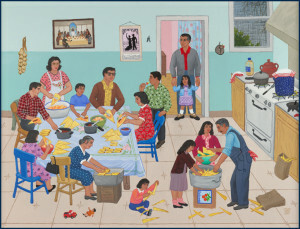 Mexican culture centers around the family. Living not far from the Arizona-Mexico border, I was always aware that the United States and Mexico are two very different cultures. In doing research for this article, I was surprised to find out that how Mexico is also very different from the other Latin American countries I had studied. Of all the Hispanic nations in the Western Hemisphere, Mexico has the highest percentage of Mestizos, that is, people of mixed Spanish and indigenous blood. Of the Latin American countries, Mexico is the one whose national image most values the combined heritage of Spain and the indigenous peoples. In Mexico City, the Plaza of the Three Cultures pays tribute to all three of these cultures. Of the Latin American countries, Mexico, in looking back at its history, most vilifies the Spanish Conquistadores. And Mexico never forgets. It is a nation, according to Mark Cramer of Culture Shock: Mexico, which so lives in the past that some knowledge of Mexican history can go a long way in helping vistor or the foreign expat in building relationships with Mexican people. If you are lucky enough to have been invited to a social gathering, here are a few guidelines: It’s best to arrive a little late. What to bring? Flowers or an alcoholic beverage are acceptable. When greeting the others, remember that it’s considered appropriate for males to give females a kiss on the cheek as well as a handshake; females graciously allow themselves to be kissed on the cheek. Women greet each other with a kiss on the cheek and a handshake. Men who have not met before shake hands, but men who already know each other embrace and then shake hands. In more formal, public gatherings (such as an event at the town hall or a large community dance, there is a protocol surrounding he “abrazo” or hug. It is initiated by higher status people and treasured by those lower-status people who receive it,according to Alan Riding, the author of Distant Neighbors. Conversations almost always been with inquiries about the health of the other person and all of their family. (This is true of written communication as well.) 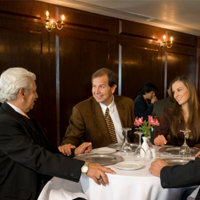 People in Mexico often say that “norteamericanos” are too blunt in jumping right into business conversations without taking time for civilities. It will also help to know something of the local and national soccer teams, and to understand references to Mexican history. Mexicans believe that a polite little lie is better than the truth, if the truth will hurt someone’s feelings. For instance, if you don’t care for the food at a restaurant that you have been invited to, it is considered rude to say so. Don’t fear looking stupid trying to speak Spanish. Mexicans appreciate that you try, and are not critical of your errors, advises Mark Cramer, author of Culture Shock: Mexico, and I have found this to be true as well, especially if I also keep in mind the other social rules in this section. In Mexico, two last names are used, both the name of one’s father’s family and the name of one’s mother’s family. 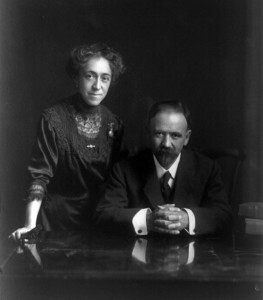 Example: Jorge Rodriguez y Moreno. 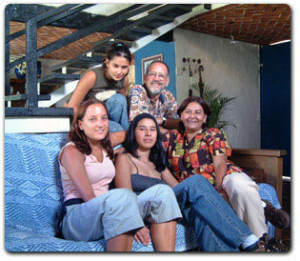 Rodriguez is the family name of Jose’s father, and Moreno is the family name of Jose’s mother. A mistake I’ve seen many tourists make is to barge right in and demand an answer to whatever they need to know, ignoring rules of common courtesy which they would follow in their own country. It’s not that they are trying to be rude, it’s because they have anxiety about communicating a need in the unfamiliar surroundings. Unfortunately, such behavior can come across as rudeness. This all sounds pretty informal, but one thing that is quite important is to know the title of people you are introduced to, and to use it when you greet them. If they are a college graduate, “Licenciado/a” is used as a title. When saying hello to an engineer, you would say, for example, “Buenos dias Ingeniero Rodriguez”. Status and appearance are everything in Mexico. Men argue over who is going to pay the check in a restaurant, even if neither of them can really afford it. Officials, high and low, expect flattery from their constituents, and they get it. “Tu” or “Usted”? Only use “tu” for personal friends. People may invite you to “tutear”, in other words, to use the “tu” form when addressing them. In rural areas, children still call their parents “Usted”. “Señora” means married. An older unmarried woman is still called “Señorita”. In Mexico, nicknames such as “Fatty” or “Shorty” are considered a form of endearment. In the US, it’s considered demeaning to call someone “Fatty”, “Shorty” or the like. So don’t take offense if someone calls you, “Gordo”. In fact, if someone does say or do anything one feels is insulting, the best strategy is to laugh it off, or ignore it, advises Mark Cramer of “Culture Shock: Mexico”. It may not be considered insulting in that culture. When a woman walks by, admiring comments made by men are not considered offensive, as long as they don’t contain gross language. The woman, of course, does not respond, or even indicate that she has heard the remark. Mexico is not a country which regards plans as set in stone. When friends meet accidentally, they may both disregard whatever plans they had had, and go for a long leisurely meal or a drink. 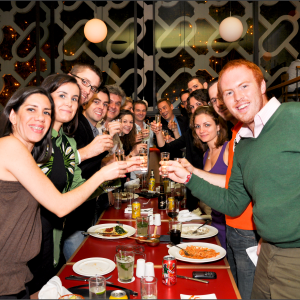 With Mexican meetings or get-togethers, the ending time is always elastic. If you are a male, hanging out with Mexican males, you may find yourself involved in a drinking contest. If this happens, participation is expected. You can always plead religious reasons or doctor’s orders. Once, on a plane from Los Angeles to Guadalajara, I was chatting with a Mexican man who was telling me how much Mexicans love to play around with words and language. In Culture Shock: Mexico, Mark Cramer corroborates what that man was telling me: that Mexicans love to have fun with words. Among close friends, there will be constant verbal jousting with each other, having fun with double entendres, etc. “The “dicho” or little saying, is alive and well in Mexico, and used often in conversation”, wrote Mark. 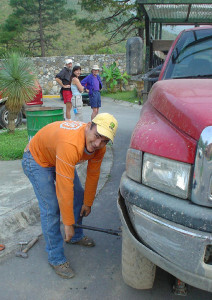 On a very remote, rough mountain road in the state of Chihuahua, my husband and I suddenly got a flat tire. We were in his new truck, and he couldn’t figure out how to get the spare tire off of the underside of the truck! Suddenly, two tall, good-looking young men drove up in a shiny red truck. They pulled over, immediately jumped out, and were down peering under the truck, the powdery white dust all over their new-looking jeans. They soon figured out the problem and helped change the tire. They at first refused to take anything for helping, but they accepted a couple of cold beers from our cooler. According to Culture Shock: Mexico this incident was not unusual. 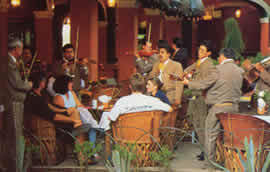 The author has had many similar experiences, and states that there is a long-standing tradition of hospitality in Mexico. People will go out of the way to give you directions. Be very polite, and wary, in your interactions with police. Drivers involved in an accident in Mexico are presumed guilty until proven innocent. Don’t blow your horn or be aggressive in traffic. Many drivers carry loaded guns in their glove compartments. Drink bottled water, and brush your teeth with it, also. Before you go, check the website of the Center for Disease Control for suggested vaccines. Do this a few months before you go, as some vaccines must be taken in a series. Consult with your doctor to suggest over-the-counter medications to take with you. An attack of diarrhea is common for travelers. Immodium AD is a good quick diarrhea fix. If it’s a violent case, antibiotics can often be bought over the counter in pharmacies. If you have time, you may prefer the slow Gatorade cure for diarrhea. I always pack powdered Gatorade, because a day of small amounts of Gatorade or Pediolite) taken with no food, and no extra water, helps me work through an attack of diarrhea without taking medications. (This result, of course, varies from individual to individual). If you do need a doctor: take the precaution of asking your hotel, or the American embassy, for a recommendation. Alan Rider asserts that “the family is the single most important reason why Mexico’s poverty has not translated into unrest.” Families who can afford to will buy up plots of land around them for their children and their families. If a family member has a job, he or she will push to find jobs for other family members, in the same business. While working in the Mesa Community College, I overheard one of the guys behind the tech support desks talking on the phone to a friend about what it was like to be part of a Mexican family. “If you marry a Mexican,” he said, “you marry their whole family.” He went on to enumerate the number of his wife’s relatives who had stayed at his house during the previous year, and the old Chevy in his driveway, which one of her nephews had been trying to sell for six months. Another person of Mexican heritage told me once, “With us, the friend of my cousin is my friend, and the enemy of my cousin is my enemy.” Once a close friendship is formed, it is as if that friend were a member of the family. Earl Shorris asserts that this level of loyalty to close friends is not found in Spain or in other Latin American countries. An extreme example of this family loyalty is given by Earl Shorris in “Life and Times of Mexico”. He states that if one of the women in a family is raped, and has no brother or father who can avenge her, a cousin with be asked to volunteer, and he will do it, even if he has to travel half-way across the country. 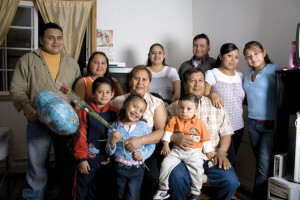 The Mexican family is patriarchal and authoritarian. Growing up in a patriarchal and authoritarian family makes it easier for people to accept the hierarchical structure of Mexican society, asserts Earl Shorris. Women were given the vote in 1953, but wives usually vote as their husband wishes them to. But, writes Alan Rider, “In many ways, this (patriarchy) is a mask. The real strength and stability of the family are provided by the woman.” The home is the center of family life, and she rules the home. 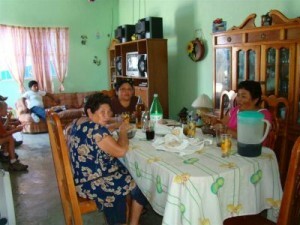 It is true that most Mexican women spend their waking hours in the company of other women. 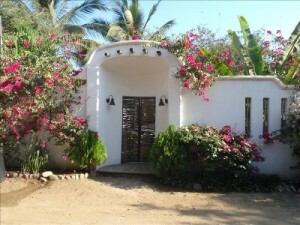 The Mexican home and courtyard or garden are surrounded by high walls, like a little fortress. The loyalty which family members show each other is not reflected outward, for the good of the town; Mexicans are not likely to give to charities or orphanages. However, they do give to the church and the church does charitable work. The main meal of the day is lunch, “el almuerzo”, more often called “la comida”, which translates as “the meal”. The meal may have an appetizer, soup or salad, an entree of meat, fish, or chicken, and rice and beans. Tortillas are often used as utensils. 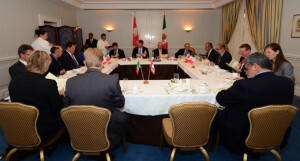 “La comida” is usually a leisurely meal, with a lot of chatting taking place before, during and after. The evening meal is rather light. The rest of Latin America tends to eat a light “continental” breakfast, but many Mexican breakfasts are hearty. (Huevos rancheros, with tortillas and beans, is an example). In general, the timing of meals is less fixed than it is in other Latin American countries. In a small Mexican town, the local priest has a lot of power. 92% of the citizens of Mexico have been baptized as Catholics. Today, the Catholic church, especially in cities, is losing some of its former power. And now we get to the middle class: everything written in this article so far does not apply to the middle class. For them it’s all available: birth control, elegant clothes, freedom for women to vote differently than their husbands, being able to afford to send children routinely to private school, summer camp and, later, to U.S. universities. However, young people of the middle class still tend to live at home until marriage, accustomed to being attended hand and foot by maids. Mexico does not have singles bars or shared apartments for singles, though the young of the middle class go out to nightclubs, private parties, restaurants and discos regularly. Not surprisingly, middle class marriages take place between known families, “people like us”. Among the middle class, it is not uncommon for the husband to have a mistress, though the economic crises have put a damper on this phenomenon. “La casa chica” is the well-known term for the separate residence of the “other woman”. It is rare for a marriage to break up because of the husband’s infidelity. In spite of this, Mexican men are often fiercely jealous. The “Macho” stereotype of the Mexican male has some base in reality. The average Mexican widow is expected to remain faithful to her late husband, though widowers are not. 1. Take your time with people. The main idea is to establish a rapport with your business contact. It’s a mistake to try to jump right into the business deal. They want to know how to place you as part of a family, or at least as part of a network of people whom they know. 2. The soft-sell works more effectively than the hard sell, but the soft sell must be accompanied by a great display of self-confidence. 4. You will have to deal with bureaucrats, who are frustrated and underpaid. If a bribe is needed, don’t jump to pay it, you may not need to. If you can bring a letter from an important person, this will help. 5. You may have to wait a while to get a licence to operate your business. It will help if you regard this wait time as an opportunity, an opportunity to develop personal relationships. 6. Manners, graciousness and attire are very important. People are more formal in rural areas. 7. Some knowledge of Spanish is important, even if you are not fluent. 8. Do not count on a business meeting or appointment starting or ending on time. 9. Almost half of the kinds of business are restricted to the government. Stock brokers, national print media, national TV stations, and national radio stations are all off limits to foreigners. 10. Mexico is a deceptively informal country. Someone may get very personal over a couple of beers, and later they will be formal again when other people are around. get away with not enrolling, but foreigners must. You will end up paying medical care, prescriptions, child care, maternity leave, old age pensions and death benefits. However, the wages you will be expected to pay are lower. Cramer feels that during colonial times the Spaniards started a pattern of taking raw materials and exporting them, and letting the Mexican people be an overworked, unskilled labor force. 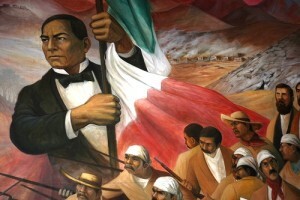 In the 1800’s, Benito Juárez attempted to get Mexico into more manufacturing. Sometimes US companies would use underhanded tactics to discourage Mexican companies from manufacturing goods. The strong family ties in Mexico can make owning a business difficult. The business owner is expected to help out any member of his family who is not as well off as he or she is. “Such a detailed historical introduction is not usually imperative for this type of book”, wrote Mark Cramer in his book on Mexico for the Culture Shock! series. Many north Americans are confused by what is meant by the Mexican Revolution. First, Mexico had to win her independence from Spain, but that struggle is not what is called the Mexican Revolution. 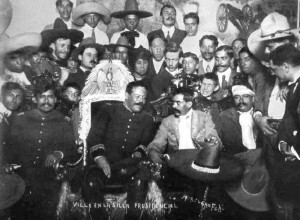 The Mexican Revolution took place later, during the early 20th century. The Mexican Revolution was not a struggle against a foreign power, it was a struggle first against the thirty-five year rule of aristocratic and despotic Mexican President Porfirio Diaz, and then about who was going to govern the new nation and what kind of nation it would be. But long before that, there was…. 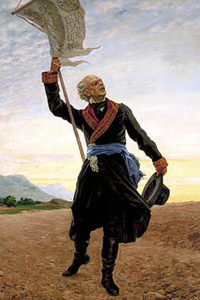 Miguel Hidalgo, 1753-1811, whose famous “Grito” is a key icon of Mexican history, was Mexican Catholic priest and the first of the Mexican struggle for independence. When he was assigned to the church in Dolores, Guanajuato, he was shocked by the poverty he found. The authorities told the poor indigenous peoples what kind of crops they could grow, crops which made money for the landowners, not for the people. On September 15th, 1810 he gave the famous, “Grito” the Cry of Dolores, calling on people to protect King Fernando by revolting against the Spaniards who had overthrown the Soanish Viceroy. 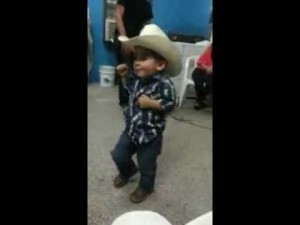 Every school child learns the famous Grito. 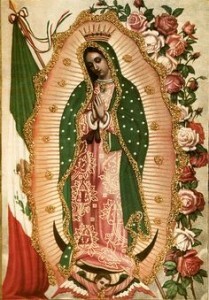 Viva Nuestra Santissima Madre de Guadalupe! Y muera el mal gobierno! Mexican Independence Day (Día de la Independencia) is celebrated on September 16th, because The “Cry of Independence” followed the Cry of Dolores, on the day afterward. Strangely, after amassing a huge ragged army of peasants and marching to the capital, Hidalgo turned back at Mexico City. He may have felt that there would be too many losses. His army turned back and made a stand at the bridge at Calderón. Most of them ran away or perished at the Battle of Calderón in Jan 1811. Father Hidalgo’s band vastly outnumbered their attackers but they were far less disciplined and trained. Hidalgo was executed by a firing squad on July 30 1811. Father Miguel Hidalgo is still called “the father of Mexico”. José María Morelos was instrumental in the armed struggle against Spanish rule. 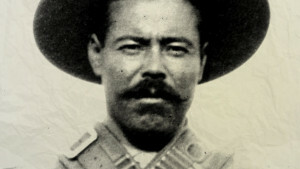 José María Morelos, who took over the struggle after Father Hidalgo was executed, was one of the Mexican Revolution’s most skilled military tacticians. José María Morelos was a Mexican Roman Catholic priest and revolutionary rebel leader who assumed leadership of the independence movement after Miguel Hidalgo y Costilla was executed in 1811. His father was a carpenter, and José worked as muleteer and on his uncle’s ranch. He studied hard as a boy and was eventually ordained as a priest. As a secular cleric, he allowed to pursue business but not to marry (but did father at least three children by Brígida Almonte). 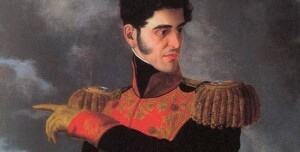 Morelos was planning with others for New Spain’s independence, and he joined Hidalgo, who asked him to recruit troops in the south and capture Acapulco. Morelos had much better military skills than Hidalgo; he gathered allies and obtained weapons. He had 22 victories in his first 9 months, including Acapulco, most of Michoacán and Guerrero by 1811, and Oaxaca in 1812. Morelos organized the congress of Anáhac, in 1813. The name referred to the ancient Aztecs. Under his leadership, a document entitled “Sentimientos de la Nación” declared Mexican independence from Spain, created legislative, executive and judicial branches of government, and respect for property. It also abolished slavery, torture, and the system of tributes. On Nov 6 the Congress formally declared independence for Mexico. 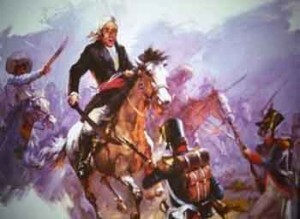 His fourth military campaign was a series of disasters beginning at Valladolid 1813. Defeated 1815 by royalist forces under Augustín de Iturbe. Morelos told his men to all save themselves and he was captured. He was jailed in Inquisition building in Mexico City, secretly, as royals did not want to make a public martyr out of him. There he was sentenced to death for treason, and executed. After his death, Guerrero, his lieutenant, continued the insurrection but it was more like a series of guerilla actions. General Augusti/n de Iturbide was successful in gaining independence for Mexico in 1821, but he made himself Emperor from 1822 to 1823. However, he is credited as the original designer of the Mexican flag. He is not treated well in Mexico’s current view of her history, because of his conservative and undemocratic views . He was defeated by General Antonio Lopez de Santa Anna. 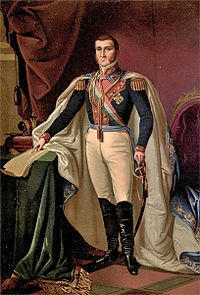 General Lopez de Santa Anna first opposed the movement for Mexican independence from Spain. but then fought for it. He served as president eleven non-consecutive times over a period of 22 years. He was a brave soldier and cunning politician who dominated his era, but Mexican historians now regard him as one of “those who failed the nation.” His military failures lost Mexico half of her territory, including Texas and the Mexican Cession after the US won the Mexican-American War. 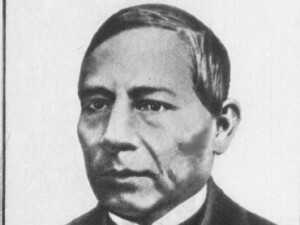 Benito Juárez was born very poor. A lay Franciscan noticed his intelligence and arranged for him to attend the seminary. In his early career he was a lawyer, judge, and a governor. He openly opposed the corrupt government of Santa Ana and this caused him to go into exile. 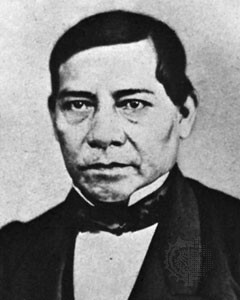 When Santa Anna resigned, Benito Juárez returned to Mexico. The winning party “La Reforma” formed a government under General Juan Alvarez, with Benito Juárez as President of the Supreme Court of Justice, under President Ignacio Comonfort. The Supreme Court’s reform laws limited the power of the Catholic Church and the military, and aimed for acivil society and capitalist economy similar to the US. 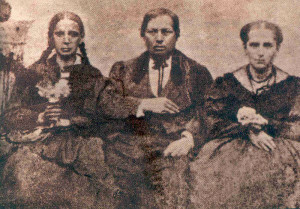 The Ley Juárez of 1855 declared all citizens equal before the law and restricted the Church’s privileges. When Comonfort dissolved the congress, to appease the Conservatives, Juárez was acknowledged by the liberals, which meant he was now leading the Liberal side of the civil war known as the Guerra de Reforma (the War of Reform). Juárez and his government fled to Veracruz. The Church was supporting the Conservatives. 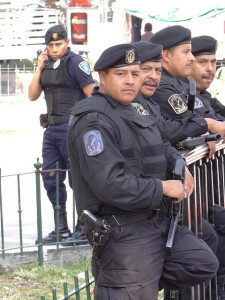 (Juárez had ordered all church properties confiscated.) Several state governments supported Juárez and so did US President James Buchanan (but not the US Congress). But the aid of Buchanan helped Juárez and he defended Veracruz successfully twice, and recaptured Mexico City in 1861. Juárez was now president, but the war had left Mexico weak financially. Juárez stopped paying Mexico’s debts, which caused Spain, Britain and France to send a joint expeditionary force to seize the customs house in Veracruz. Spain and Britain withdrew and the French intervention began in 1862. The Battle of Puebla 1862 was the initial Mexican victory of the French (which is what the holiday Cinco de Mayo celebrates). The French forced Juárez and his government to flee Mexico city, and go all the way north to Ciudad Juárez (then called Paseo del Norte but now named after him). Meanwhile, Maxmilian was proclaimed Emperor Maximilian of Mexico on 20 April 1864, with joint backing of Napolian III and a group of Mexican conservatives. President Andrew Johnson demanded the French evacuate Mexico, felt it was a violation of the Monroe Doctrine, and imposed a naval blockade in February 1866. Congress wouldn’t support him, and it is said that Andrew Johnson had the US Army pretend to lose some supplies in the Gulf of Mexico, which really went to Juárez. French troops began pulling out in late 1866, because of opposition from the US and threats from Prussia. The last of Emperor Maximilian’s forces were defeated and he was executed, against the wishes of the United States and many in Europe. Juárez felt that he had to carry out the execution because Maximilian’s government had executed many rebels. Juárez was reelected President in 1867 and 1871, suppressing revolts such as Porfirio Di/az. He died of a heart attack while in office. Today Benito Juárez’ memory is honored because of his progressive reforms for equal rights, separation of church and state, lessening the power of the military and the church hierarchy, and his defense of Mexico’s national sovereignty. He was the only president Mexico has had who is of pure-blooded indigenous heritage. Juarez successor was President Tejada who was put out of power by Porfirio Diaz. 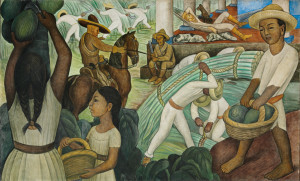 The Mexican Revolution was an armed conflict which lasted from 1910 to 1920. At first it was a fight against the Díaz government, and then it became a civil war and a struggle for what kind of nation Mexico would be, and what kind of government it would have. The Mexican Revolution started when Francisco I. Madero led a revolt against Porfirio Diaz,under the Plan of San Luis Potosí , which was a political document written in San Antonio Texas, and published in the Mexican city of San Luis Potosi in 1910. The document stated that the Díaz presidency was not legitimate, declared Madero as provisional president, called for democracy, and demanded the return of lands to the villagers who had had them taken from them. Madero was overwhelmingly elected in a free election. However, he was opposed both by conservatives who thought he was too liberal, and former revolutionary fighters who saw him as too conservative. He was assassinated in 1913. General Victoriano Huerta reinstated an autocratic regime in the power vacuum which occured after Madero’s assassination. 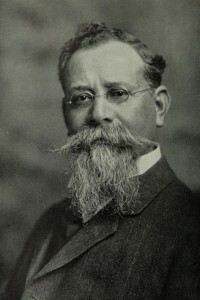 Venustiano Carranza had supported Madero’s struggle. 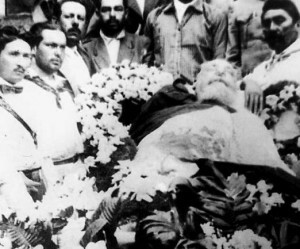 After Madero was assassinated, Carranza led the northern revolutionary Constitutionalist Army to defeat the counter-revolutionary regime of Victoriano Huerta, and then defeated his fellow revolutionaries. He served as head of state from 1915-1917, and with the Mexican Constitution of 1917, he was elected president from 1917 to 1920. From a rich landowning family, Carranza was far more conservative than southern peasant leader Emiliano Zapata or Northern revolutionary general Pancho Villa. Once he got power he wanted to eliminate them. 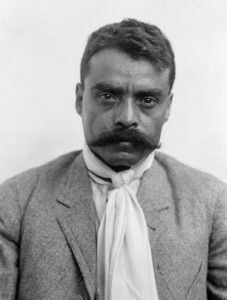 Villa was in alliance with southern revolutionary Emiliano Zapata, who remained fighting in his own region of Morelos; however, the two revolutionary generals briefly came together to take Mexico City after Carranza’s forces retreated from it. In 1915, Constitutionalist General Obregón defeated Villa. Mexicans do not forget that due to US Ambassador John Wilson’s one-sided deal, Carranza’s side got guns and Villa did not. Zapata went back to the state of Morelos, kept on fighting guerilla actions with his followers, and was assassinated in 1919. The current constitution of Mexico was drafted and adopted during Carranza’s administration, but he did not implement the parts of it which would anger the rich, such as giving labor more power, giving the peasants back their lands, or suppressing the power of the Catholic Church. He tried to pick his own successor, which was when northern generals including Obregón and rose up against him under the Plan of Agua Prieta, and he was assassinated trying to leave Mexico City. This ends my summary of the legends of Mexican history. I have tried to cover those names, both the heroic and infamous, which may come up in conversation or be remembered with statues or place names. The central highlands of Mexico are dominated by Mexico City. Two mountain ranges, the Sierra Madre Oriental and the Sierra Madre Occidental, run north to south and cradle the central highlands. (“Oriental” means “east” and “Occidental” means “west”. 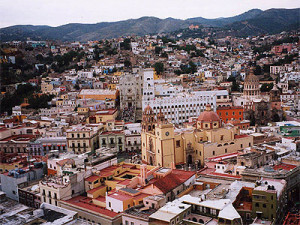 Outside of Mexico City, Guadalajara, Jalisco, Nayarit, Colima and Michoacán are the main cities. 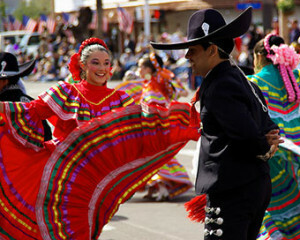 Guadalajara is home of the traditional “Tapatio” (a term which comes from a Nahuatl word and means anyone or anything associated with Guadalajara). 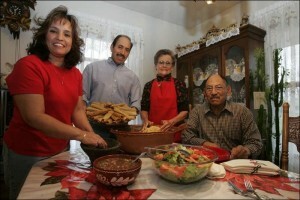 Traditional Tapatio neighborhoods, maintains Alan Rider, are proud of their criollo blood. 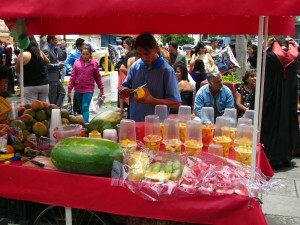 He states that few of the major businesses in Guadalajara are owned by people with lower class roots. The traditional neighborhoods of Guadalajara still close down for the long lunch, or “siesta” time. 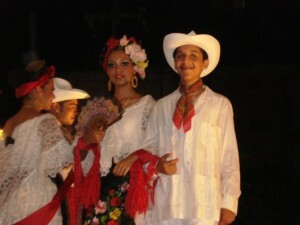 The heritage of Veracruz is similar to that of Cuba, with a mix of African, indigenous, and Spanish ancestry. The people of Veracruz call themselves “Chilangos”. The oil boom has changed the rest of the Gulf Coast, but Veracruz keeps its identity. The folk music of Veracruz is the Son Jarocho. The music has native, Spanish, and African elements. In its folk form it is played on small guitar-like instruments, an acoustic bass guitar, and percussion instruments such as the güiro, made from a gourd, and the quijada, made from a donkey or horse jawbone. An modern example of this genre is the song “La Bamba” which was made popular in the United States by Ricardo Valenzuela, whose stage name was Richie Valens. Some internet sources state that “La Bamba” is the unofficial anthem of Veracruz. 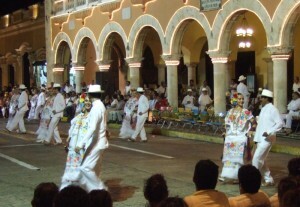 The primary folk dance of Veracruz is the Jarocha. 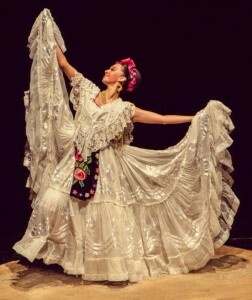 The costumes worn by the Jarocha dancers is similar to Cuban dance costume. 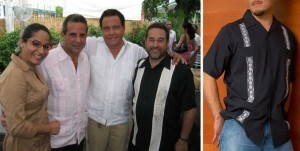 The male partners wear the guayabera shirt, also popular in Cuba. 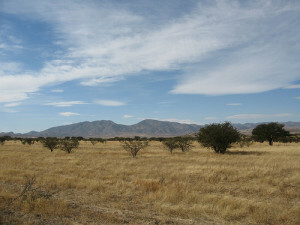 The mountainous northern part of Mexico has forests, deserts and plains. Distances between towns are further (the northern states are among the larger in Mexico) and the climate is drier. According to Alan Rider, in Distant Neighbors, in the mountainous north of Mexico, “people are more daring and efficient, more outspoken and informal…. than most Mexicans”. Stetson hats and cowboy boots are common. 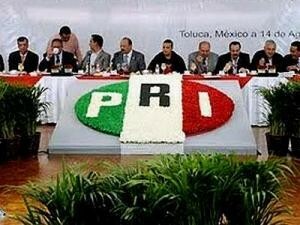 The power base of the north lies in well-off, conservative farmers and businessmen, powerful and tight-knit clans (The PAN political party which for more than half of the 80’s decade took power away from the long-standing PRI, originated with a group of rich northern farmers and businessmen.) The main towns are Hermosillo, Culiacán, Los Mochis, and Ciudad Obregón. Then there are the border cities: Tijuana, Mexicali, Nogales, Piedras Negras, Ciudad Juarez, Nuevo Laredo, Reynosa, and Matamoras. These areas have exploded with population due to the maquiladoras (factories owned by US companies, whose labor force is 90% female). 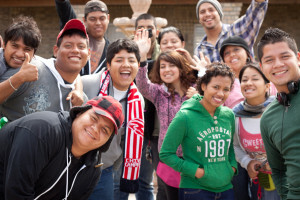 Poormigrants come from all over the country to work at these companies, and also to try to cross the US border and find work as laborers and maids in the US. America. Well-known artists include Ramón Ayala, Los Tigres del Norte, and Los Tucanes de Tijuana. Another popular genre is “banda”. 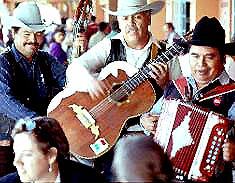 Banda music was also influenced by German polka music, from the late 1800’s when many Germans settled in the north of Mexico. 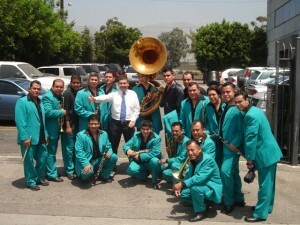 Banda is also popular with Mexicans throughout the United States, and, like música norteúña, has spread in popularity to other areas of Mexico. The dance styles of the north were influenced by the ballroom dancing which was danced by the Mexican aristocracy: polkas, Polish mazurkas and redowa, schottische, and waltzes. The lower classes took these forms and danced the Mexican polka, and the two step to the “corridos”. During the Mexican revolution the corrido became a kind of musical way of spreading news. The “Yucatecos” have hardly any industry, but a fierce pride in their “Republica de Yucatan”. Merida, one of the main cities, was not connected to the national railroad until the 1950’s. The main ancestry in the Yucatan is Mayan. In Oaxaca, Zapotec and Miztec ancestry predominates. The area was ruled by the PRI until the 2000s, although the student movements of the 1970’s brought down the state government and teachers’ strikes have been frequent since then. 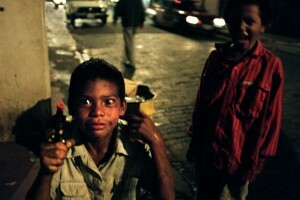 The 2006 uprising in Oaxaca city brought in groups protesting the heavy marginalization of the poor. Oaxaca elected a PAN governor in 2010. Tourism and development was threatened by the violence associated with the 2006 uprising, which severely curtailed the number of incoming tourists for several years. Guerrero includes Acapulco and tourism is a large industry, which makes it different than the rest of the south. 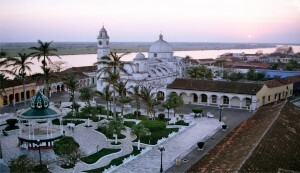 Chiapas is the southernmost state, and has a coastline on the Pacific, to its south, and a humid climate. 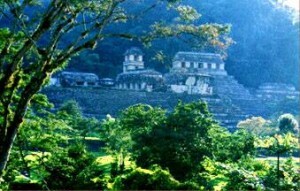 The ancient Mayan ruins are located in Chiapas. At one time it was perennial rain forest, but is now cleared agriculture and ranching. Bananas and other tropical crops can be grown in part of the state. Some of the mountain areas are temperate and foggy enough to have developed cloud forests, where nature reserves protect quetzals and other animals. Indigenous people have been rebelling occasionally for all of Mexico’s history. 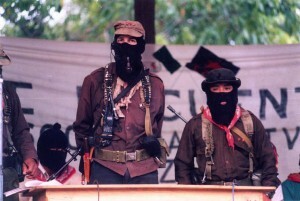 The last was the 1994 Zapatista uprising, which led to some improvement in rights for indigenous people. The music of the Yucatan peninsula is the Jarana. It is done in either 6/8 or 3/4 time, and is performed by a band ensemble of wind instruments. In modern times the jarana dancers may be accompanied by singers with guitars. 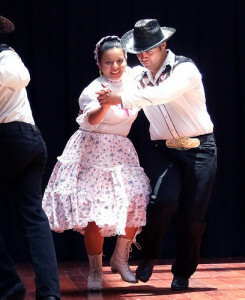 The jarana is a dance in which both the male and female partner do the same steps. “People like this work 365 days a year,” a cab driver told us. Mark Cramer points out that it is interesting to look around you in Mexico and see how many different Mexicans do to survive. Things which “norteamericanos” would discard, in Mexico someone will know how to fix it and either use it or re-sell it. 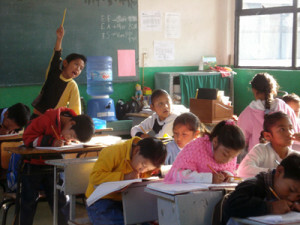 Many children do work, and are helping to support their families. Another interesting fact is that the child hustlers who keep trying to sell you something, watch your car for you or wash your windows, may be having to pay a percentage of whatever they earn to a boss who controls all that area. The many Mexican laborers who illegally cross the US border send money home to their families. This money contributes more to Mexico’s economy than does all of its own agricultural production. 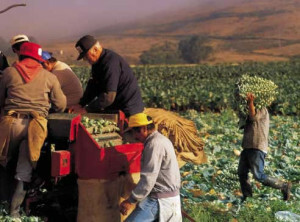 Many North Americans would be surprised to find out that the labor force which harvests United States crops includes such a high percentage of illegal Mexican workers. Taking into account the total labor force of Mexico, average earnings are lower relative to the cost of living, than they are in the US. The average vacation is shorter compared to those in Europe. For workers who do work at a job with benefits, those benefits include medical care, prescriptions, child care, maternity leave, old age pensions and death benefits. However, because wages are low, several wage-earners must share a household to get by. Earl Shorris agrees, “The social network leaves out those who need it most.” In cities, abandoned orphans form gangs and make their living from crime. Vaccination programs since the 1930’s caused huge drop in infant mortality, resulting in a population explosion. Wealth is concentrated among a few. There is no unemployment insurance, so the unemployed must depend on their family’s help. Around 1976 the government started working to stem the population crisis, and by 1984 the population growth was lowered to 2.5%. But the economy still does not keep up, though government stores such as the CONASUPO grocery outlets tried to help. The list of sad statistics goes on. Twenty-nine percent of all deaths in Mexico are in children under the age of five. The principal causes of death are pneumonia and enteritis, both of which are preventable diseases. (Vaccination campaigns had mostly eliminated malaria, typhoid, and measles.) There are some areas of Mexico where almost 90% of the population eats little meat, eggs, or milk. In the 1980’s when Distant Neighbors was written, half of the population never went to see a doctor, while there were 20,000 doctors who cannot find jobs. The three books I read did not have much good to say about Mexican politics. I have tried to summarize what they did say. Mexican officials who speak abroad never ever criticize their own country. Within their own country, they also talk a good story, and seem to believe in reasons to to justify their presence. Presidents may be said to be “leftist” or “rightist” but it’s mostly an act. In the 1940’s civilians took control of the government in the 1940’s. But it didn’t really change things. Presidents may be said to be “leftist” or “rightist” but it’s mostly a . Political cliques are fiercely loyal to their own leaders but do everything they can to make things harder for those who do not work for their boss. Most politicians use their jobs as a way to accumulate money. Most Mexicans see the bureaucrats as time-wasting, dishonest, and only interested in “number one.” Once a a person has a job in the civil service, they keep their job and continue to be paid well even with low productivity on the job. 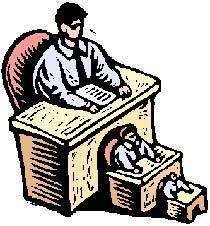 The bureaucrats themselves feel that they are in a special class. If a bureaucrat wants to survive, he or she must cooperate in a system which rewards those who are most loyal to their own particular boss, including taking extra payments from citizens in order to have paperwork expedited. Nepotism is common in getting government jobs. 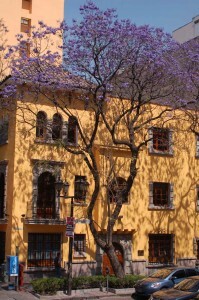 Policy is made by Mexicans who are educated in foreign universities. A degree from a prestigious American university matters more than actual ability to solve the problems at hand. 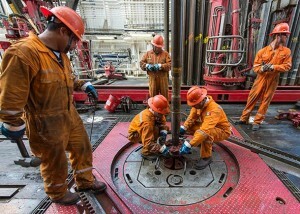 The two most powerful unions in Mexico are the teachers and the oil workers. 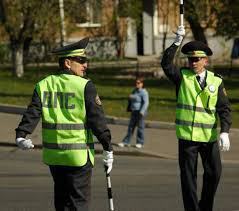 The traffic cop’s wages are so low that he depends on “la mordida” (bribes) to make a living wage. The ordinary citizen does not respect the police. Real criminals pay protection money to keep from being prosecuted for drug, prostitution and smuggling. The courts do not provide dependable justice. 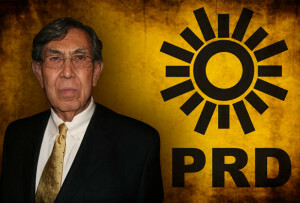 For years the PRI dominated Mexican politics. In 1994, the devaluation of the peso caused many of the middle class to lose their businesses and it looked like the PRI’s reign might be threatened. the election). As a reporter, author Earl Shorris attented a PRD reception, and found that in spite of their leftist rhetoric, the reception did not include any of the street workers or poll watchers who did the grunt work for the party. 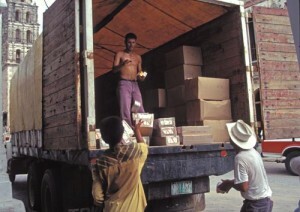 In 1994, the devaluation of the peso caused many of the middle class to lose their businesses. 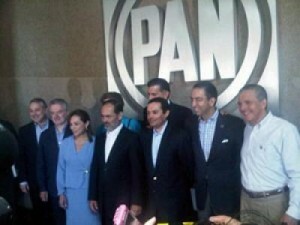 In 2000, the PAN candidate Vincente Fox was the firstto end 71 years of rule by the PRI. 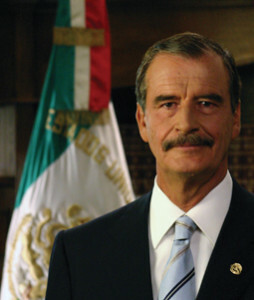 He ruled until 2006, when the PRI returned to power with their candidate Felipe Calderón. The following things, according to Mark Cramer, author of Culture Shock: Mexico, have harmed the US relationship with Mexico. US officials unwittingly do things which Mexico considers an affront to its national self-respect. Through a lack of understanding the culture. There are deep resentments in Mexico still over incidents which happened long ago in Mexican history, such as the role of US ambassador Henry Lane Wilson in conspiring with Victoriano Huerta in the overthrow of President Madero (who was assassinated). Mexicans still remember the way American troops returned in pursuit of Pancho Villa, and the arrogant way they negotiated with President Cardenas. There were strong protests in Mexico over the Bay of Pigs stand-off. because the US forced Mexico into policies which were felt to have humiliated Cuba. When our President Carter returned from a Mexican visit he mentioned that he’d had a bout of “Montezuma’s Revenge”, and this comment was printed in the US newspapers, duly taken up in the Mexican press, and regarded as a great insult. Cramer feels that Reagan actually was the best at personal relations, but anger at US policies kept the ill-feeling alive. Mexican have felt that the ambassadors which the US has appointed to them are not high-status enough to show respect for our neighbor nation. 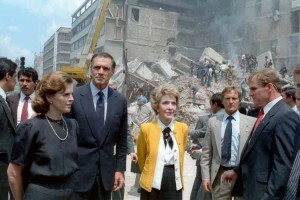 They felt that John Gavin, ambassador from 1980-1986, patronized them. Author Cramer feels that both sides choose the politically safe route of doing nothing, because the compromises necessary to find an agreement could anger the consituencies at home. This entry was posted in Latin America on January 14, 2015 by Laviajera1.